The hopes of finding an amicable solution to the vexed water dispute involving Punjab, Haryana and Rajasthan have become more feeble with the Rajasthan High Court’s directive to Punjab on Monday to hand over control of the three headworks on the Bhakra-Nangal and Beas projects to the BBMB. Finance Minister P. Chidambaram has bent a little, but stays firm to face the storm over two of his most controversial budgetary proposals. The National Democratic Alliance’s decision to continue its boycott of Parliament, after participating in the debate and voting of the Finance Bill on Monday, is unfortunate. Its concern on the issue of tainted ministers is understandable but how will boycott help resolve the problem? It is indeed surprising why the Manmohan Singh government has not yet adopted noted jurist and distinguished Rajya Sabha member Fali S. Nariman’s Bill on judicial statistics. Clearly, the Bill, if enacted, will make a far-reaching impact on the Indian judiciary. VIPs can be a pain. But the DDCA got away lightly for not giving the Union Sports Minister access to the VVIP enclosure at the Kotla one-dayer between India and Pakistan in Delhi. The Punjab Cricket Association had a much nastier experience when the Australians under Bill Lawry toured India in the 1960s. For an Indian Army officer who secured the surrender of 93,000 Pakistani soldiers after a war that led to the birth of Bangladesh in 1971, Lt. Gen. Jagjit Singh Aurora (retired), who died on Tuesday, was surprisingly modest. The secret report of Assam Governor Ajai Singh to the Centre about the large-scale influx of Bangladeshis to India every day has raised a question mark once again over the controversial Illegal Migrants Determination by Tribunal Act passed by the state government. Farming is a sum total of harsh realities coupled with weather uncertainties. In addition, we must not lose sight of the fact that the wheel of agriculture in India is moving in the predominantly small farm holdings. The hopes of finding an amicable solution to the vexed water dispute involving Punjab, Haryana and Rajasthan have become more feeble with the Rajasthan High Court’s directive to Punjab on Monday to hand over control of the three headworks on the Bhakra-Nangal and Beas projects to the BBMB. The issue is so sensitive and complex that countless tribunals and court orders in the past have failed to solve it. The latest order only complicates the matter further and may cause additional delay in a settlement. The Punjab Government is certain to file a case before the Supreme Court, which is already seized of the matter in a slightly different context. The latest twist may prolong the endless battle of wits. The reason is that every state has made water sharing a prestige issue where giving even a drop of water to the neighbouring state is considered a “sellout”. A lot of misinformation has been peddled freely. For the sake of a few votes, leaders have resorted to political heroism and have in the process sacrificed camaraderie and good neighbourliness, whether in the case of Punjab and Haryana or Tamil Nadu and Karnataka. The problem will continue to fester till the mindsets change. The court decision will pull in quite the opposite direction. Indications are that Punjab may now question the Punjab Reorganisation Act 1966 itself. After all, it has already reneged on the key water agreement unilaterally. A bitter legal battle may also ensue challenging the locus standi of the Rajasthan High Court to pass any order to Punjab when no cause of action took place in Rajasthan and no agreement was signed in that state. Uncomfortable questions are also likely to be asked as to how a case that involves a dispute between states can be decided on a petition filed by an individual or a private organisation. But the most unfortunate spinoff will be the increased friction between the neighbouring states. The states involved are clearly unable to resolve the long-outstanding dispute, nor is the Central government in a position to do so. The dispute has now been thrown into the lap of the apex court. It remains to be seen whether it can at all be of any help in the matter. Finance Minister P. Chidambaram has bent a little, but stays firm to face the storm over two of his most controversial budgetary proposals. While exempting the saving accounts from the withdrawal tax, he has not let go individuals, Hindu undivided families and companies from the tax net if they withdraw beyond a certain limit from their current accounts on a single day. While the concessions extended are commendable, the basic objection to this proposal that it would raise banks’ workload remains valid, though to a lesser extent. Elders, women and other vulnerable sections of society need a comprehensive social security more than minor tax concessions that the Finance Ministers announce from time to time for cheap clapping from their party colleagues. India must move towards building a broad safety net. There is no reason not to appreciate the intention behind the fringe benefit tax proposal. The corporate sector must share part of its profits with the government whose favourable policies have made their growth possible apart from their own responsibility towards society. The tax administration, however, should be simple, transparent and trouble-free. The reason why corporate India is not enthusiastic about the dilution of the tax on perks is that it involves procedural complications. Tax officials and lawyers will thrive on confusion over what is taxable and what constitutes a fringe benefit, leading to increased litigation and adding to the burden of the already loaded tax tribunals. In recent years whatever limited tax reforms have been undertaken, their overriding thrust has been to simplify the tax structure. The cobweb woven by the Finance Minister around the fringe benefit tax is contrary to the spirit of the tax reforms. Besides, selective benefits to businesses create doubts about the government’s sincerity, encourage corporate pulls and pressures and sends the message across that the government is open to manipulation. It will also encourage companies to hide expenditure and pass on benefits to employees in some other form to evade tax. Why encourage all this? Why not just tax a certain percentage of corporate expenditure? Let companies have some breathing space. The National Democratic Alliance’s decision to continue its boycott of Parliament, after participating in the debate and voting of the Finance Bill on Monday, is unfortunate. Its concern on the issue of tainted ministers is understandable but how will boycott help resolve the problem? It must end the boycott and attend Parliament immediately. Strangely, boycotts have become a ready tool in the hands of the Opposition to disrupt Parliament. 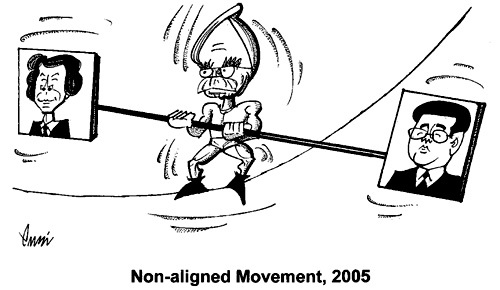 In the last Lok Sabha, the Congress had paralysed Parliament for several days on the Tehelka controversy. It also had boycotted the then Defence Minister George Fernandes for 22 months! Consider the extent of damage the members have been inflicting on Parliament by their irresponsible conduct. No doubt, the presence of tainted ministers in the Manmohan Singh government causes concern. This is more to do with compulsions of coalition politics. The Prime Minister would find it difficult to drop Railway Minister Lalu Prasad Yadav from the Council of Ministers as his government is heavily dependent upon Mr Yadav’s Rashtriya Janata Dal which has 24 members in the Lok Sabha. At the same time, as Dr Manmohan Singh said the other day, the nation should draw “new guidelines” and set “new standards” on who could be included in the Council of Ministers or those who were to be identified as “tainted ministers”. While disposing of the petition on this issue not long ago, the Supreme Court too left it to Parliament’s wisdom to examine and evolve appropriate solution. As the nation is deeply agitated over the issue of criminalisation of politics, let the UPA, the NDA and other political parties sit together and evolve a consensus on how to prevent criminals from entering Parliament and the state legislatures at the entry level itself. To begin with, the criminal and corrupt elements should not be given party tickets to contest the elections. This will have a salutary effect on the electoral system, cleanse the polity of the ills and, above all, improve the quality of governance. Members owe it to themselves — and to the nation — to conduct in a responsible manner and protect Parliament’s credibility as an institution. It should not lose the respect of the people. Nor should the opposition parties resort to frequent boycotts. Unfortunately, the Judicial Statistics Bill (No. XII of 2004) could not be introduced during the Budget session of Parliament last year following the early adjournment of the House. Since then it has been hanging fire and has made little headway. Neither Parliament nor the government has taken any initiative in this regard. Ironically, though the judiciary has emerged as the most powerful institution of governance today, it is at the crossroads. It has been passing through a period of stress because of a plethora of problems — from the deviant behaviour of a few judges to clogged-up courts mainly due to poor work ethic and non-performance. Mr Nariman’s Bill holds the key to judicial reforms. It addresses the problems and seeks to find solutions by evolving a new data matrix on the functioning of the three-tier system of governance — District Courts, High Courts and the Supreme Court. Mr Nariman’s contributions to the legal field, especially to the development and enrichment of constitutional law and practice, are well known. Why is the Centre then pussyfooting over a Bill that seeks to inspire and motivate the judges and all others to put in their best and deliver speedy justice to the people? In all fairness, Parliament should have no objection to the Bill as it is intended to help the common man and restore people’s confidence in the judiciary. In his Statement of Objects and Reasons for the Bill, Mr Nariman suggested that the availability of data would help one to assess the courts’ performance better and suggest remedies for the backlog of cases. It would also help people and bodies like the Law Commission to diagnose the “accurate fault lines” in the judiciary. The Bill is relevant because the public discourse on reforming the judiciary and ensuring its accountability has never focussed on the need for easily accessible official data on the mechanism for the administration and delivery of justice. The Bill envisages the authorities at the national, state and district levels for the collection and publication of judicial statistics. It also provides for the preparation of reports at the national and state levels on the criminal, civil, constitutional and other businesses of the Supreme Court (and the High Courts) and various tribunals, a commentary on the trends revealed by the statistics, and detailed information about case flow. As it is a Private Member’s Bill, it cannot ordinarily become law unless the government adopts it and introduces the Bill after a proper debate in Parliament. As it suggests practical measures to secure justice, all political parties should support its adoption and enactment. Mr Nariman feels that it will not compromise judicial independence. On the contrary, it will help strengthen people’s trust, faith and confidence in the judiciary by making it transparent. Judicial accountability requires transparency in the working of the courts. The judiciary has always been coming to the rescue of the common man against the arbitrary actions of the state. Consider any issue — the fundamental rights, the Directive Principles of State Policy, admissions, illegal mining, air pollution or even the brazen abuse of discretionary power under Article 164 (i) by Governors like Syed Sibtey Razi — the judiciary has not failed in its duty to protect the Constitution and uphold the rule of law. No wonder, it enjoys tremendous support from the people, the intelligentsia, voluntary organisations, civil society, members of the Bar, the media, etc. Concerned citizens are, therefore, deeply perturbed by instances of irresponsibility and misconduct on the part of some judges. This brings to the fore the core issue of judicial accountability. There had been tension and factionalism in the Punjab and Haryana High Court for quite some time. The then Chief Justice, Justice B.K. Roy, and a majority of the judges were not getting on well. In an unprecedented move, 25 judges took a day’s casual leave on April 19, 2004, in protest against Justice Roy’s attitude towards them. He was finally shifted to the Guwahati High Court after almost a year of uncertainty. The shoddy conduct of some judges of Delhi, Rajasthan and Karnataka High Courts too showed the higher judiciary in a poor light and shook the conscience of the nation. Equally disturbing is the question of judicial non-performance. The wheels of the judiciary have either derailed or move at a snail’s pace. Look at the huge backlog of cases in the courts. Shouldn’t we have a system to make judges accountable? Of course, judicial accountability has a broader connotation. Today, it raises pertinent questions of the quality of judgements, arrears and delays, inequities in accessing justice, the balance of power and good governance, uncertainties in law arising out of conflicting opinions and the ineffectiveness of the existing mechanisms to deal with judicial corruption. True, judges are the repositories of justice and social values. But if they fail to discharge their duties properly and effectively, what is the way out? The executive and the legislature are, in their own spheres, accountable to the people for their actions with a proper system of checks and balances, and reward and punishment. But there is no such system for the judiciary. The judges can be impeached by Parliament under the Constitution, but the procedure is cumbersome and time-consuming. In the US, judicial performance commissions deter improper conduct by judges and suggest ways to discipline them. India doesn’t have such a system. The Supreme Court collegium, headed by the Chief Justice of India, is doing its best, but there is a strong case for strengthening this internal institutional mechanism. It needs to be given more teeth. At present, it is mostly the CJI’s leadership and initiative that help in resolving matters. He generally has to take the support of the other members of the collegium in decision-making. The Parliamentary Standing Committee on Law and Justice recently recommended the setting up of a judicial reforms commission to make the courts accountable. The Law Commission, in its 121st report (1987), and the National Commission to Review the Working of the Constitution (2002) had also recommended this. Even though Union Law Minister H.R. Bhardwaj told the Rajya Sabha on March 21, 2005, that the government would not bring forward a Bill on judicial accountability, Parliament must adopt Mr Nariman’s Bill. The judiciary is bound to play a crucial role in the coming days. At the same time, questions about judicial accountability will become shrill and forceful. One cannot brush them aside because critical appreciation of the judgements and the working of the judiciary are part of free speech, rule of law and a measure of judicial accountability. Parliament must pass Mr Nariman’s Bill to enforce judicial accountability and reform the judiciary. VIPs can be a pain. But the DDCA got away lightly for not giving the Union Sports Minister access to the VVIP enclosure at the Kotla one-dayer between India and Pakistan in Delhi. The Punjab Cricket Association (PCA) had a much nastier experience when the Australians under Bill Lawry toured India in the 1960s. The North Zone match had been allotted to Jalandhar. The association’s secretary, H.R. Mohla, was a tireless worker, but never let anyone else come close to the PCA, and his one-man act finally caught up with him when he found that with the game barely 10 days away he had neither the guarantee money to pay the BCCI, nor was the stadium in any condition to hold the fixture. And default, for any reason, would mean disaffiliation of the association. In desperation he sought out people who he thought could bail him out. Three or four of us, whom he approached, assured assistance. For generating funds we enrolled life-members by the dozen. But getting the Burlton Park Stadium, where the match was to be played, ready for the fixture, was beyond our resources. The district administration was very uncooperative. The only person who could help was the army’s Sub-Area Commander, in the cantonment. He was also the ex-officio Vice-President of the PCA, because the ground of the army club was often used for Ranji Trophy fixtures. When we went to meet him, he first expressed surprise that the PCA had finally remembered him. But he, too, belonged to Jalandhar and when we told him that if we failed the town would be blacklisted, his pride came to the fore. However, he told us in blunt army language to just stay out of his way till the match was over. He then took charge and within a week the stadium was in ship-shape condition. Nothing very fancy, but in a very functional army style it had been cleaned up, the chalk lines marked, the stands made sit-able and, before the game started, fauji jawans were manning all the entrances. Half an hour into the match an important-looking man with half a dozen flunkies in tow arrived at the VIP entrance and tried to march in. His demeanor was that of someone who owned the place. In a sense he did. He said that he was the President of the local “Mooncepalty”, to which the stadium belonged. He was asked for his ticket or entry pass. He had one. So, only one could enter. The others were told to get lost. Pleading by the PCA office-bearers had no effect. The “Colonel Sahib”, who was in charge and to whom the matter was referred, cared two hoots for the wannabe VIPs. He had his orders. Seething with rage the Municipal President stormed back to his office and did the only thing he could. He directed that the water supply to Burlton Park be shut off. With no water the change-rooms started to stink. By the tea-break the stench became unbearable. The army then mobilised its tanker fleet and, somehow, managed to tide over the next two days of the match. But the damage had been done. The Australians vowed never to visit Jalandhar again and, as far as I know, they have kept their promise. General Aurora sought neither fame nor credit for the first decisive victory the Indian Army had won after the country’s Independence. That telling moment was captured for posterity in a now famous black-and-white photograph of the surrender ceremony on December 16, 1971, at Dacca, as the capital of the then East Pakistan was called. General Aurora, flanked by Indian Army, Navy and Air Force officers, is looking at Lt. Gen. A.A.K. 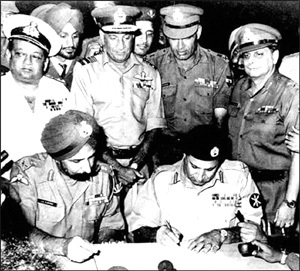 Niazi of the Pakistani Army as he signs the surrender document, with a borrowed pen. There is no smile or smirk on the victorious Aurora’s face — just the straight lines of a professional soldier. That is what made him dear to the then Army Chief, Gen. S.H.F.J. ‘Sam’ Manekshaw, who hogged the glory for the 1971 war and later became India’s first Field Marshal. General Aurora himself quietly served his tenure as the chief of the Indian Army’s eastern command and then faded away, seemingly into oblivion. He emerged again on October 31, 1984, when anti-Sikh riots broke out in the Capital — and the rest of the country — in the wake of then Prime Minister Indira Gandhi’s assassination by her Sikh bodyguards. General Aurora and a group of friends, who included I.K. Gujral, who later became Prime Minister in 1987, ran from pillar to post as they tried to wake up a government machinery that had gone into hibernation as the riots raged. Once the riots abated, General Aurora fought relentlessly for the rehabilitation of the victims and to ensure that they got justice. That the fire had not gone out of him was evident from the affidavit he filed before the Nanavati Commission that probed the riots. “From our meetings with the functionaries responsible for maintaining law and order it appeared they were not at all concerned about the killings of Sikhs... From (their) attitude it was apparent the government was not interested at all in protecting the lives and property of the innocent Sikhs,” General Aurora had said. It was a measure of the man that he did not hesitate to speak his mind out. It was this mindset that perhaps enabled General Aurora to opt for the unconventional while planning the Bangladesh operation. The Indian Army’s normal methods, be it by training or tradition, had been the set piece battle. General Aurora realised that he had a maximum of a fortnight to get to Dacca, and he decided to dump the conventional. Out went established tactical concepts and in came mobile, flexible thrusts that would be carried out with determination and dash. The Indian forces, said the General, would have to throw the enemy into such confusion that before they recovered, the Indian divisions would begin converging on Dacca. “I’m surprised Niazi didn’t even think of defending Dacca,” General Aurora modestly told Col. P.N. Khera of Asian Defence News International in an interview in December, 1999. General Aurora also served a Rajya Sabha term as an Akali Dal nominee but maintained a low profile during the 1986-92 tenure. Born on February 13, 1916, in Kalle Gujran village of Punjab’s Jehlum district, which is now in Pakistan, Jagjit Singh Aurora studied at Rawalpindi’s Mission School and then Dehra Dun’s Indian Military Academy. He was commissioned into the Punjab Regiment on January 1, 1939, and commanded the same battalion in the 1948 Kashmir operations. He served as Director General, Military Training, at Army Headquarters and commanded a corps in the Northeast before heading the Eastern Command. The report, contents of which were leaked to the media recently, is seen as the vindication of the stand of about half a dozen organisations, including the All Assam Students Union (AASU) and some individuals, who have filed petitions in the Supreme Court for striking down the Act on the ground that it has failed in its aim to check illegal immigration. Instead, it has proved a shield for nearly 20 lakh Bangladeshis, as per the Governor’s report, settled in the border districts of the state. Governor Ajai Singh’s report is not the first such document on the issue as a former Governor, Lt Gen S. K. Sinha, who is now Governor of Jammu and Kashmir, had also sent a similar report to the Centre in 1998 suggesting that the illegal influx from Bangladesh has changed the demography of lower Assam, which has turned into a “Muslim-majority” region. The settlement of a huge population of foreigners in the border districts has posed a grave threat to the security and integrity of the country, Sinha’s report had said. The petitioners in the apex court, including the All India Lawyers Forum for Civil Liberties, which filed the initial PIL and former AASU leader Sarbananda Sonowal have sought a direction to the Centre to place on record Sinha’s report. A three-judge Bench, headed by Chief Justice R C Lahoti has sought the Centre’s response to the applications for summoning of the report on record. Ironically, the Centre and Assam Governments have been taking different stands on the IMDTA when different parties are in power. The Court during the marathon hearing, going on for past several months on the petitions challenging the validity of IMDTA, asked the Assam Government to explain about the danger of dual law to deal with foreigners issue only in the state. Farming is a sum total of harsh realities coupled with weather uncertainties. In addition, we must not lose sight of the fact that the wheel of agriculture in India is moving in the predominantly small farm holdings. With the expanding network of communications, shrinking distances, a progressive IT revolution and consumerism, farmers are not living in isolation as was in the bygone times when rural people lived in close harmony with nature. These people also aspire to be equal partners in this era of changing lifestyles in India. Hence mechanisation was justified, as less time consuming efforts were needed so that an average farmer could send his children to school and college and dream of a more prosperous future. In view of social upheavals in the rural and semi-urban Punjab poverty, marginalisation of farmer, drug addiction, unemployment, out migration and health hazards due to the soil and water pollution as also debt and suicides — have prevented farmers from focusing on their profession as in the late sixties. The individual farmers is struggling and sustaining irrigation by increasing the depth of tubewells and this has helped the nation to sustain production. Hence, economic gains from farming in Punjab should be calculated by including this “natural resource depreciation factor in geometric progression” which the individual growers and the state have been suffering annually to sustain the central foodgrain reserves for decades and has culminated in the present scenario of grave concern. But the crux of the dilemma is that the farmer alone continues to pay for it and it is recommended that he should change his cropping pattern. Growing crops to the desired precision is not a job which is learnt in a year or so, instead it is a long drawn-out process of dedication over the years. Cultivation of alternative crops and to achieve adequate remuneration from these will require a gestation period, but the pace of socio-economic changes leave little scope for the debt-ridden farmers to experiment with new crops. Therefore, to wean an average grower from cereal monoculture, it must enshrine “least disturbance to the farmer” with an in-built provision for his socio-economic security in the crop diversification programme to achieve this important agenda of the environment. National policies must include provisions for arresting environmentally eroding intensive cropping practices in agriculture, as it was a form of “soil mining”. Economic compensation for phasing out rice is essential for growers because prosperity with the onset of the green revolution reached and touched the lives of not only farmers but also created avenues for varied forms of agro-industry as well as generated resources for consumer goods. Hence an extra effort is needed to save the environment as it will benefit each and every individual in the region. Environment agencies should be roped in to supplement the efforts to diversify the cropping pattern in the state and generate resources to protect the growers. Losing site of the individual grower, his aspirations with respect to the general social scenario will not help because the chain of environmental degradation was not set in by him alone but was propelled by consumers and industry along with political compulsions for the sake of food security, national dignity and stability. We are inclined to believe it is time for the Government to take some effective measures to prevent the swelling of the surge of rebellion among our Anglo-Indian fellow-subjects. Some of these men have, it seems, been carrying matters to excess, and not only openly defying the Government but preaching sedition in no indistinct toncs. Ever since the Ilbert Bill was proposed, the exponents of Anglo-Indian opinion in the country, with some honourable exceptions, have raised a unanimous cry, which is as much remarkable for its violence as for its unreasonableness. We think the “Englishman” is solely responsible for all the mischief that has since taken place. But what is still more to be regretted is that the “Englishman” has no mind to stop where it proceeded. It has lately been quite surpassing itself and brandishing arms of defiance against the constituted authorities in a most contumelious manner. When the Devas fused the mortal man complete, they all entered into him. Therefore one who knows man regards him as Brahman’s Self. Just surrender yourself to Him, you will then feel His grace.